Race managers led by PRO Giancarlo Crevatin made a bold decision to hold as many races as the light air conditions would allow today, which was two on one course area and only one on another. This meant Classes A and C had two races to determine the podium finishers, while Class B had only one race...at least this would get to the seven needed to trigger a discard. In Class A the first race was won by Sandro Paniccia's Scuderia 50 Altair 3, repeating their race win yesterday. The early series leader - Maurizio Poser's Swan 42 Sheraa Yacht Club Hannibal - went off on the wrong side of the course in this race and thus had a mediocre result, putting them in a difficult position to retake the series lead and win Gold in the final race since there were too many other contenders too close in points. The points compression was made worse by having discards kick in which brought the big fast boats into contention. Besides, being one of the slowest rated boats in that class they could not tactically control any of these larger faster boats. Sheraa did what they could do by winning the final race, but the big boats scoring 2, 3 and 4 this brought their totals into within 3 points among the top four teams. Fortunately for Sheraa that last race win allowed them to win the tie break with Altair and keep them on the podium in the Bronze position. So on the strength of one race win and consistency with no finish worse that 4th place, Vincenzo Onerato and his Mascalzone Latino team racing his Cookson 50 have won the ORC World Championship for Class A, with last year's winner - Vadim Yakimenko's Russo-French team on Freccia Rossa - earning Silver medals. 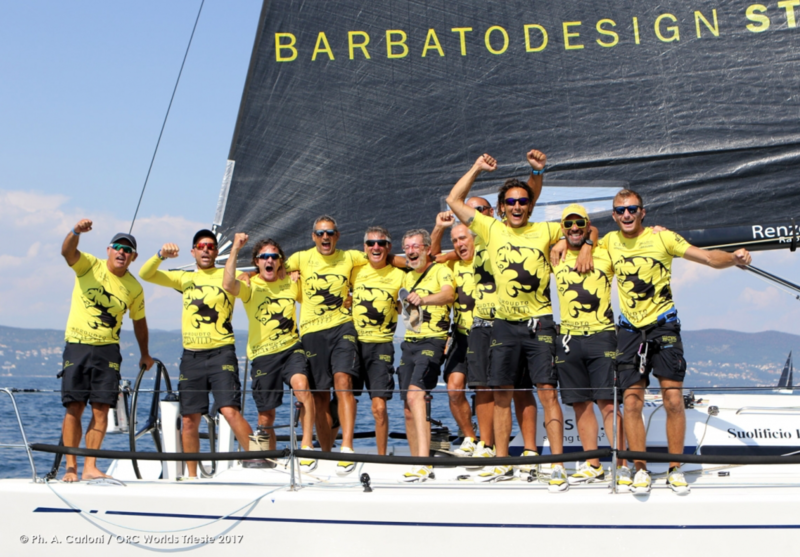 On Onerato's team were numerous top Italian sailors, including Andrea Ballico, Lorenzo Bressani, Leonardo Chiarugi, Stefano Ciampalini, Francesco Mongelli, Davide Scarpa, and Matteo Sivelli. In Class B the leader through most of the week was Diego Zanco's Croatian team on his X-41 Nube, and a discard of their 16th place in the second offshore race looked like it would keep them on top with a reasonable result in the last race. But disaster struck: a 17th place in the race made them keep their 16th and take them out of contention for a podium finish. Meanwhile a team that had never been in the top ranks due to a 38th place in the second offshore race but had been quietly collecting excellent scores of 2-1-1-2 in the inshore races, and a final 1st place in the last race, was now vaulted to the top with the discard. Renzo Grotessi's Swan 42 Be Wild and his CSQ2 Sailing Team are the new ORC World Champions in Class B. This team consists of Luigi Masturzo, Lorenzo Cantarini, Andrea Casale, Riccardo Cesini, Giuseppe Filippis, Gian, Luca Gennaro, Sandro Iesari, Aris Leandri, Nikolaos Mascoli, and Roberto Pellegrini. Winning silver medals in Class B was Massimo De Campo's Swan 42 Selene Alifax, and inning Bronze medals was Nadia Canalez's M45 Horus Tempus Fugit. Class C was similar to Class A, with many contenders, some large point discards and two races to determine the ultimate champions. At the beginning of the week in the offshore races some perennial and proven favorites at past ORC championship events looked strong, but as the inshore racing progressed other teams started rising to the top, and with some heavy point discards waiting until Race 7, these teams were poised to pounce today. And the team that not only rose quickly to the top but also eliminated any doubt by winning both of today's races was Roberto Monti's modified Melges 32 Airis, the new ORC World Champions in Class C. This team has been on the podium at previous World Championships, namely being Bronze medal winners in 2012 in Helsinki sailing their GP 42 of the same name, but this is the first time they have been able to claim the top prize. Sailing on Airis with Monti this week was Casare bressan, Diogo Cayolla, Michele Gregoratto, Victor Marino, Glauco Turco Albatros, and Vittorio Zaoli. Silver medalists in Class C were the Loro Piana brothers Giacomo and Franco on their Farr 30 Sease, and winning Bronze medals was the team on Alessio Querin's Farr 30 Mummy One-Lab Met. All-amateur teams at this event qualified for Corinthian class trophies, and the top in Class A was in 9th place overall: Danilo Falzitti's TP 52 Zerocould. In Class B the Corinthian winner was 9th placed Ermanno Galeati's Grand Soleil 43R Reve de Vie, and in Class C it was 4th place finisher Andrea Bazzini's X-35 Extrema. "This was a tough championship, with many potential winners," said ORC Chairman Bruno Finzi. "No one clearly dominated any one phase of the competition, and not knowing the winners until the last race is proof how demanding this was. "There was also a wide diversity of boat types here, with many of these on the final podium, so we are pleased at how well the rule seems to be working in producing fair racing among this variety of boats. We applaud all the participants, thank the organization for the outstanding efforts they made all week to produce an excellent event, and congratulate all the winners for their high achievements."